Monster Energy will replace Sprint as the sponsor for NASCAR’s No. 1 series, NASCAR announced Thursday afternoon in a hastily arranged news conference. LAS VEGAS — NASCAR has found a new sponsor for its premier series. Monster Energy, one of the largest energy drink companies in the world, will replace Sprint as the sponsor for NASCAR’s No. 1 series, NASCAR announced Thursday afternoon in a hastily arranged news conference. The exact name for the top series has yet to be determined, NASCAR chairman and CEO Brian France said, and he would not release the length of the deal other than to say it was a multiyear agreement. But either way, Monster’s marketing will undoubtedly usher in a new era of stock car racing. Monster sponsors athletes across all forms of motor sports, and it has an edgy feel to its millennial-targeted branding. The energy drink had been most associated with action sports, but will now have NASCAR as a major part of its image. On a stage flanked by two relentlessly smiling Monster Energy girls dressed in form-hugging black outfits, France heralded a new day in NASCAR. He used the word “fun” a half-dozen times and spoke of how Monster could help reshape NASCAR’s image. Monster will also sponsor the All-Star Race in May and become the official energy drink of NASCAR. It was unclear what kind of impact the deal would have on premier series car sponsors like 5-Hour Energy, but competitors may be grandfathered into the deal as was the case when Sprint/Nextel arrived. It will also continue to sponsor Kurt Busch’s No. 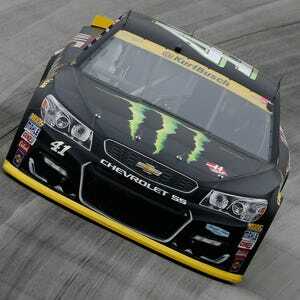 41 car at Stewart-Haas Racing, Monster Energy Chief Marketing Officer Mark Hall said. Busch was among the many drivers in the audience for the news conference, sitting among the racetrack executives and media in a conference room at the Wynn Las Vegas. Moments before the announcement, drivers asked by USA TODAY Sports were enthusiastic about what Monster could do for stock car racing. Dillon said he envisioned parties and other events that would excite a millennial audience more than NASCAR has done in the past. Denny Hamlin, who said he knows Monster Energy vice president of sports marketing Mitch Covington personally, smiled at the thought of what the marketers can do with this opportunity. The announcement was part of a long journey that began in December 2014, when Sprint announced it would not return to NASCAR after its contract expired. NASCAR initially said it expected to sign a replacement by mid-2016, but the search dragged on through the fall and even the completion of the season. For a time, there was speculation NASCAR might go into 2017 without a title sponsor at all. And as late as Wednesday, no announcement on a sponsor was expected. 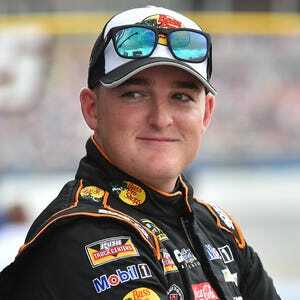 But as drivers and members of the NASCAR industry filed into the annual Myers Brothers Awards Luncheon on Thursday morning, NASCAR announced a news conference would take place shortly after the conclusion of the event. France said courting Monster was “one of the few sales calls that I actually personally made,” but it was important because he knew the energy drink could reach “different places and different audiences” than NASCAR currently does. NASCAR has long struggled with an aging fan base and has made a major push to reach the next generation of fans. But that hasn’t seen major success yet, at least according to television ratings and attendance figures. If Monster is able to bring the feel of its lifestyle and image to NASCAR, it could dramatically change the atmosphere around the racetracks. Monster has a huge roster of athletes and entertainers it supports, and there will certainly be a considerable effort to provide crossover among them. “When they leave the racetrack on Sunday, they’ve had an experience,” he said. Hall noted Monster has been in NASCAR for nearly a decade — first with Robby Gordon, then with the Busch Brothers in the Xfinity Series with the No. 54 car. That type of NASCAR experience was just the beginning, as it turns out.